Americans are all about super-sizing. We’re so obsessed with big, bigger, biggest. It doesn’t matter whether it’s a cheeseburger or a plasma TV. We want it big. So what happens when you’re in the market for a new pickup truck and a super-sized cab just isn’t big enough? You MEGA-SIZE it! Several years in the making, the Dodge Boys have done just that – they’ve mega-sized the Dodge Ram. Once baked, the Mega Cab’s cab is 12 inches longer than the 2005 Ford F-250 Crew Cab! Now that’s big! Overall length remains unchanged at 247.7 inches. Just being big isn’t enough, though. You have to do something with that space, and that’s where Dodge really put pencil to paper (or stylus to design tablet). How do you outfit a big truck cab and still leave 72.2 cubic feet of interior cargo volume? 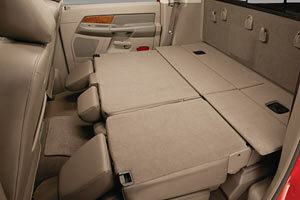 How about putting a nice storage bin behind the back seats, where there is 7.7 cubic feet of space? 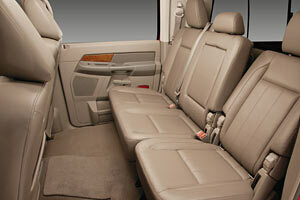 How about giving old-school back seats the axe and letting them use that space to recline from 22 to 37 degrees? How about doing all this and still have enough space left over for three full-grown adults to stretch their legs out in the 44.2 inches of rear leg room? All this got thrown into the Mega Cab batter and more. 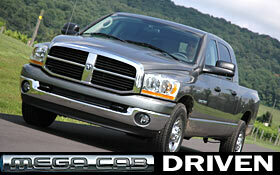 But Dodge is not just looking to squeeze large families or six-man roofing crews into Mega Cab. For those needing to haul home that new plasma TV in the rain, you can squeeze it through the 34.5 inch wide, 85 degree door opening, fold down the 60/40 seats and store it on the 16.8 square foot flat floor in the rear. It’s so big, it looks like the back of a Durango back there. Heck, there’s even room to put your groceries in the back for the ride home, as well. 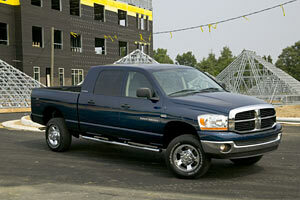 2006 sees a freshening of the full Dodge Ram lineup. An all-new frame is one of the big highlights, but the new year is also evident in the new front end and interior. Dodge has taken the signature big rig grille and given it a more up-to-date look with larger headlamps that wrap around the sides, offer 22% more light intensity, and match more closely, the latest styling of the Durangos and Dakotas already in production. Inside, the Rams get all new seats and a new dash, as well. Though Dodge has never been at the top on our interior design favorites list, the new look is definitely an improvement. Fit and finish is better, and though there are still a lot of sharp angles and non-textured surfaces, it definitely looks and feels better than the outgoing models. One thing we did also take note of is the leather used, which is of considerably higher quality than the last round of Rams we drove. It no longer seems like faux leather. Bravo! Dodge brought us to beautiful Leesburg, Virginia to have our first look and drive of the new Mega Cabs. We spent half the day in a 2500 Laramie Mega Cab 2WD with the Cummins 5.9L Turbo Diesel and optional 5-45RFE five-speed automatic. The second part of the day, we chose a 1500 SLT 4x4 with the 5.7L HEMI gas engine and automatic. My morning in the 2500 was very enjoyable. Having spent a lot of time owning and driving various pickups, the size was not at all intimidating to me and I don’t think it would be to any other pickup drivers. Just remember to make those wider turns! The Cummins 5.9L provides 325bhm @ 2900rpm and 610 lb.-ft. of torque at 1600 rpm. With the optional 4.10 gear ratio, this guy could tow a 15,900 trailer. You wouldn’t even feel that trailer-queen rockcrawling buggy on even the heaviest of trailers with this thing. You could even haul your buddy’s rig and still have plenty of power left over. While the 1500 trucks have independent front suspension, the 2500 and 3500 trucks get heavy duty live axles. The rear ends of all trucks get leaf springs and live axles and the 3500 gets an additional auxiliary leaf spring. Our 2500 was a 2WD so it had a rack-and-pinion steering, which provided excellent on-center feel and a reasonably good 47.9 ft. turning circle. Steering was tight and road isolation was near-perfect to my liking. Trucks are notorious for feeling – well – too trucky. This truck felt big and heavy but had very little wander and tracked wonderfully at every speed. The ride was smooth and very comfortable for something so large. Driving through the rolling hills of Virginia was a joy. The Cummins reacted quickly to even the slightest changes in throttle pressure and had no problems at all passing the slow pokes on any grade. One thing that really sticks out in my mind about the ride was how quiet and non-smelly the Cummins was. Dodge engineers have done a wonderful job of decreasing NVH (Noise, Vibration and Harshness) in the new Rams. It was so quiet that we honestly forgot that we were driving a diesel at one point! Later in the day I had the opportunity to drive Ford and Chevy trucks and was amazed at how loud and uncivilized they were compared to this new Ram. The Ford was just plain noisy and the Chevy sounded like it was sick. I let one of the Dodge engineers drive for a while and had a seat in the back. 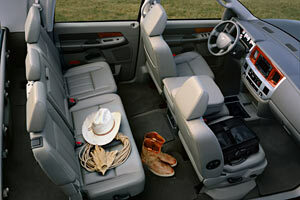 My cowboy limo had so much legroom that I was able to recline fully, put one leg over the other, and dangle my foot without hitting the seats in front of me. This totally rocked, but I do have to say that the seats were still overly stiff – despite the nice reclined position. Almost there, Dodge – almost there. After lunch I had the chance to tow a fifth wheel horse trailer with the Cummins. I had never towed anything this large or heavy but was eager to have a go at it. Rather than risk a herd of live horses on a pack of press wolves, Dodge smartly loaded the trailer with distributed weights and sand bags until it reached the maximum towing capacity of the truck. Talk about heavy! Towing was a breeze. Not once did I even have to push the pedal down very far to get the rig moving, let alone feel like I was anywhere near the limit, as we pulled the trailer around the countryside. Amazing stuff. The ride back to the hotel was taken in a 1500 4x4 gas version (HEMI not available on the 3500). The HEMI puts out 345 bhp @ 5400 rpm and 375 lb.-ft. or torque @ 4200 rpm. We’ve been big fans of the HEMI, just like everyone else on the planet and it did prove to be an ample engine for this truck. 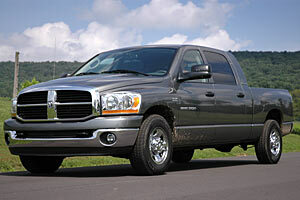 In most cases, Mega Cab owners will find the HEMI a nice match for the truck. It moves the truck around just fine and, like any gas engine, will come in a good bit less expensive than a diesel. But, if you’re truck experience requires you to do heavy towing, than the Cummins is the only way to go. 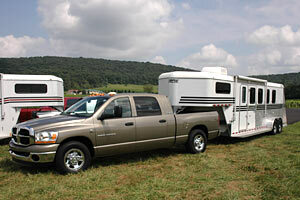 The low-end torque and towing capabilities are unmatched compared to the HEMI. One thing we did notice right away in the 4x4 version was the recirculating ball steering system. I hadn’t yet crawled underneath the Mega Cab or read the press kit to see what the differences were, so I got a nice smile from the engineer riding with me when I correctly commented that the steering on the 4x4 transmitted more road feel into my hands and felt completely different from the 2WD I drove that morning. The steering wheel reacted to every curve, bump and defect in the road and let my hands know about it. Tracking around curves was not as smooth as the 2WD version, either. This isn’t to say that the truck drove like a lifted Jeep with wobbling beadlocked tires, but there was definitely a noticeable difference in the road feedback I was receiving through this setup and this was attributed to the different steering setups, as well as the independent vs. solid front axles. Dodge, as well as Chrysler, continue to impress us with their innovative offerings. The Mega Cab is no different. If you need a full-size truck and people or interior cargo hauling is high on your list, this is a must-see pickup. Dodge has come so far over the last few years on the Ram pickup that if you haven't been in one lately, you really need to check them out. 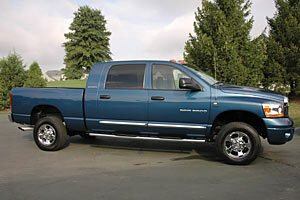 When it comes to size, power, and capability, Dodge Rams - especially the Mega Cabs - have the competition beat. Pricing ranges from $32,760 to $48,595 including $900 destination fees. 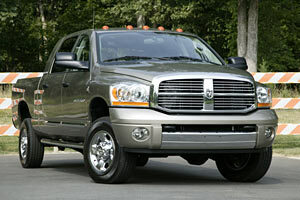 For more information on options, specs and features, visit www.dodge.com. Production has started now and trucks should be available at dealerships this fall. Michael Cohn is the Editor of Rockcrawler.com and resides near Birmingham, Alabama. Michael enjoys going on press rides, where he can beat up fleet vehicles and not have to clean them up or fix them at the end of the day. Sure beats monthly payments, too.